Find out how Cypress Fairbanks Independent School District migrated 65,000-plus devices to Windows 10 in just two and a half months. Empower students without compromising security & compliance. Learn how Denton Independent School District centralized its service desk, leveraged self-service and voice automation to free up IT staff. K-12 IT departments need to be equipped with the right tools to empower a 7th-grade science teacher to create a digital lesson plan on photosynthesis and deliver content and quizzes just to his students’ class iPads. At the same time, a high-school math teacher needs to lock all devices into “assessment mode” to give an in-class calculus test. IT challenges range from supporting 1:1 initiatives, protecting against ransomware, configuring and patching staff and student devices, users, apps and settings of devices used in specific classes in a school district to managing and securing multi-user mobile devices so schools can safeguard hardware by keeping it within the classroom. There is no denying that the demands of managing and securing technology can overwhelm understaffed K-12 IT departments. But you can’t ask teachers to do IT work…or can you? Make it easy with self-service and automation. The demand for technology in the classroom is always increasing, but budgets and resources aren’t. A school system extends beyond faculty and students to include administration, food services, transportation, and security personnel—and more. Piecemealing systems to manage different device types, ownership and operating systems quickly makes K-12 IT staff feel overwhelmed with multiple systems in its management process. With possible overlap as well as oversight, this creates inefficiencies and increases the risk of errors in data security, such as the challenge of keeping the various computing devices provisioned, patched, and updated. Manage and secure a growing number of tablets, phones and laptops. Support BYOD initiatives and enable learning on the go. Safeguard mobile devices from loss and theft. Streamline purchase and management of mobile apps, manage volume app licenses, even distribute and revoke licenses as necessary. Tablets and other devices may change hands throughout the school year. Easily discover what hardware needs to be purchased, updated, and maintained in order to keep costs down and your assets in good health. Track software licenses to make the most of the software programs you already purchased. Seamlessly integrate with Apple school manager. Deliver all of the learning content, licenses, and class roster information from Apple’s portal to the students, teachers, and classrooms where it is needed quickly and automatically. End of support dates for prior Windows versions are fast approaching. Migrate thousands of machines quickly. Map and update dozens of apps and drivers to the appropriate users and devices, plus restore user data and settings. Automate important updates while also making it easy for users to manage their own environment with self-service, knowledgebase and voice automation. Free up technical staff at the school sites. Configure systems automatically at the start of each school year. One in ten educational organizations has been hit with malware (BitSight, 2016). Eliminate the chances of unintentional and intentional breaches from within and outside the firewall. 1:1 ipad program, Windows, Mac or Android devices need to be managed in a unified manner. Faculty, students, and staff require the privileges needed to be productive without the security exposure of full admin rights. Proven IT solutions to enable digital teaching and learning. Ivanti has provided school districts with the ability to automate, manage and secure their IT services and devices for more than 20 years. Students and staff are able to focus on learning and rest easy knowing their devices are centrally managed and secure. K-12 IT managers in large districts significantly reduce their security risk and ensure students safety, while providing a seamless and well-managed learning experience. As a result, Ivanti K-12 customers benefit from lower single-vendor costs and overhead, allowing them to devote more resources and budget to learning initiatives. Centrally manage, configure, and deploy Windows, Mac, iOS and Android endpoints on and off the network with more efficiency and less disruption. Gain visibility and track all your most critical IT assets throughout their entire lifecycle to optimize performance, value, compliance and cost. Protect against even sophisticated threats with solutions ranging from patch management of your third-party apps, mobile security, priviledge and access management to a complete defense-in-depth security framework. Automate service delivery to improve IT support performance and efficiency enhanced with workflow automation, self-service, voice automation to efficiently support students and staff. When IT is not scrambling to manage and secure a fragmented fleet of devices with variable operating systems and ownership statuses, data is more secure and IT resources are not wasted. With the proper support in place, K-12 districts can leverage the benefits of mobility and digital learning tools to better run, grow and transform their schools. Allow settings and apps to follow students — rather than devices — from class to class. Multi-user configurations also allow budget-constrained schools to extend the benefits of Apple’s powerful classroom technology to more students through dynamic smart policies. Manage user privileges at a deep, granular level. Prevent unauthorized code execution. And enforce software licensing through our singular “trusted ownership” model and an improved approach to traditional whitelisting and blacklisting. 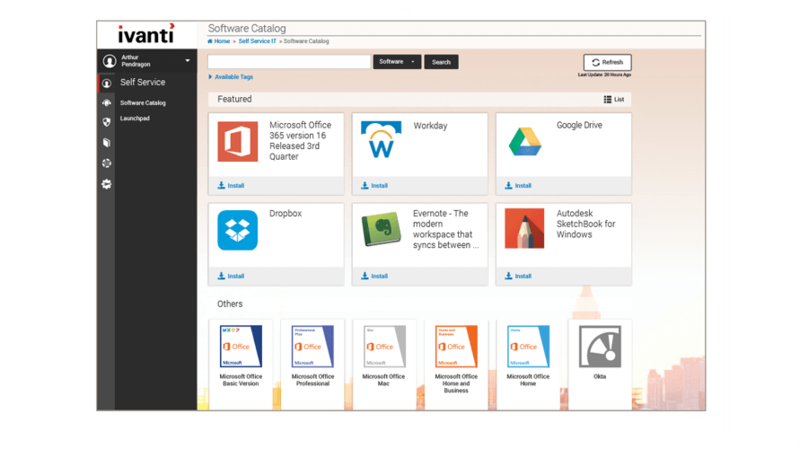 Automate discovery, patch management, and application and device control. You can even isolate infected devices and take action swiftly to keep malware from spreading. Cut the time and cost of application-package customization by decoupling application settings from the package itself. Automate app configurations based on the destination OS and elevate user privileges dynamically to install. Migrate your users and applications efficiently and securely. Automate delivery of complete migrations and customizations to all of users, even across multiple operating environments and device types.